The Ford F-150, Nissan Titan, and Ram 1500 earned top scores in the passenger-side small overlap test from IIHS. But the agency says most pickups need improvement according to the procedure, which involves a vehicle’s right front corner crashing into a rigid barrier at 40 mph. IIHS started issuing these ratings in 2017 over concerns that automakers were focusing more on driver-side safety. The F-150 performed the best in the test, says IIHS. It earned “Good” scores in each of the injury measures tested. The structure held up well in the crash, and the seatbelts and airbags worked to control the movement of the passenger and driver dummies. Neither dummy recorded any potential injuries. In contrast, the Tundra was seriously compromised. The A-pillar intruded into the passenger’s space, and the passenger dummy’s head hit the grab handle attached to the pillar. 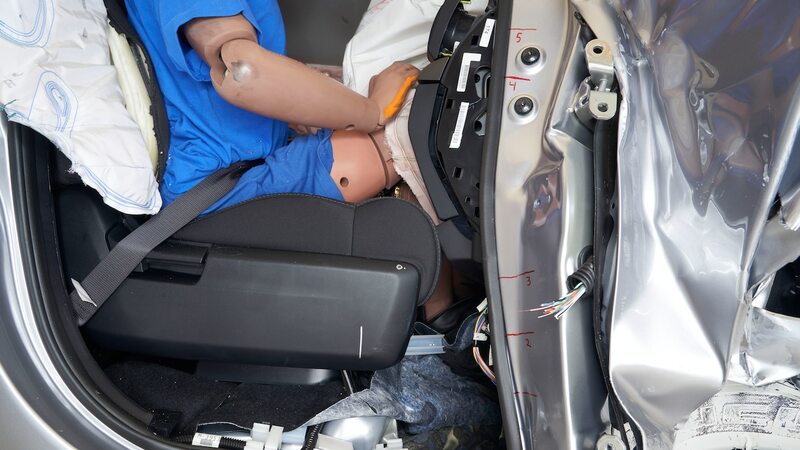 In a real life crash of this severity, a dummy would likely injure his or her right lower leg, and injuries to the right hip would also be possible, according to the agency. The Tundra’s structure from 2007 is considered quite old, although the Frontier has the oldest structure, dating back to 2005. IIHS says it isn’t surprised that pickups are falling a bit behind in this test. These vehicles took longer than other vehicle segments to master the driver-side small overlap test, which is the same type of test applied to the vehicle’s left front corner. That test has just one dummy in the driver’s seat, however, while the passenger-side test has both front seats occupied. Frontal crashes are more severe for heavier vehicles like pickups because the kinetic energy involved correlates to the weight of the vehicle. Although it performed just OK in the passenger-side test, the Honda Ridgeline remains the only pickup to receive a Top Safety Pick award in part because it has a “Good” rating for its headlamps, unlike other vehicles in the category. To qualify for the award, vehicles only need an “Acceptable” rating in the passenger test. They must also score “Good” in the driver-side front overlap test, moderate overlap front test, side test, and roof strength and head restraint tests, as well as “Advanced” or “Superior” in front crash prevention and at least “Acceptable” in the headlight category.